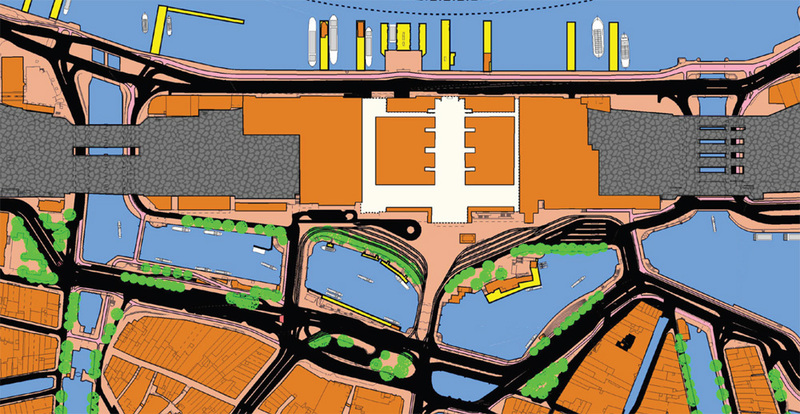 Exiting Amsterdam Central Station will become a completely new experience in the coming years. 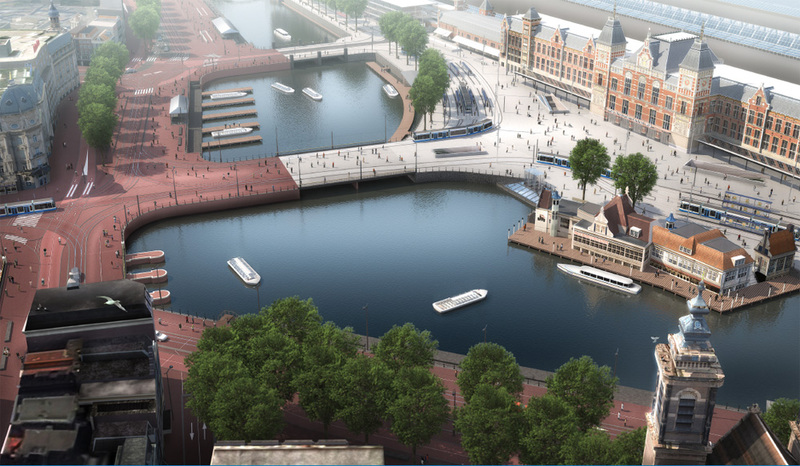 Amsterdam is updating the street design on the so-called station island and the entire pedestrian route into the city centre. Now that the works for the North-South metro line are in their final stages the city can finally update all the public space right over that metro line. Amsterdam has decided to do more than just “put the stones back in”. It will create a ‘red carpet’ to have a great promenade into the city. People on bicycles will also benefit, but motor traffic will be restricted. The corner of Damrak and Prins Hendrikkade has clearly not enough space for people walking and cycling. Motor traffic will almost be completely banned from here (one lane will remain from Damrak (on the right, turning right to the far side of this picture). 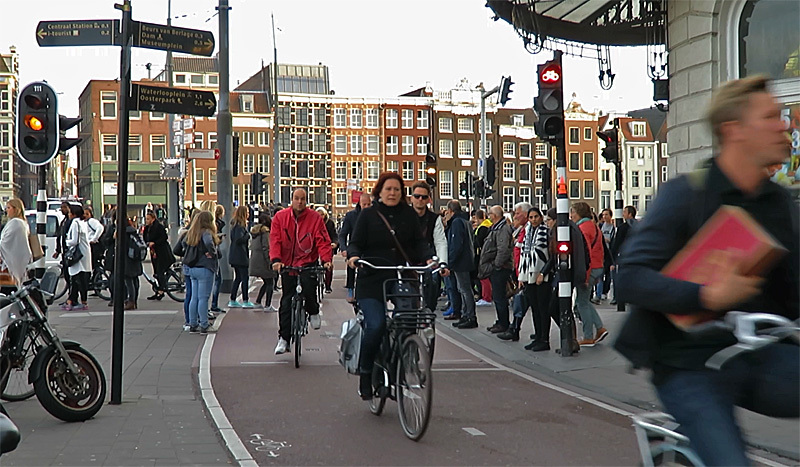 The area in front of Central Station was oddly enough totally designed for motor traffic even though most people arrive by bicycle and on foot at the station. Amsterdam was quite late to put in four-lane roads in the city centre. After failed projects such as the Jodenbreestraat you would have expected the city to stop with these big new roads, but they continued to build them. It was only in the 1980s, that part of the water in front of the artificial island that the station was built on in the 19th century, was used to build a network of roads with multiple lanes for private motor traffic. These roads existed until the turn of the last century when the works for the metro-line started, but in a way they still exist. The city has decided to do things completely different, now that the public space over the almost finished new metro line can be restored again. The city decided to take this opportunity to give the area a ‘quality impulse’. 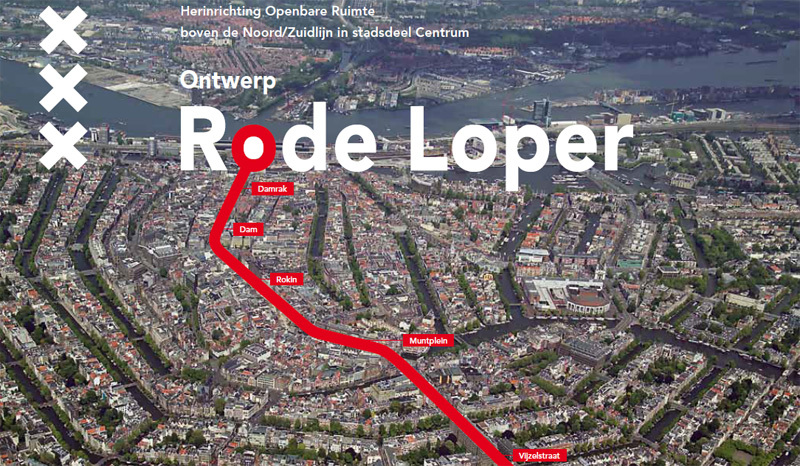 The project got the name “Rode Loper” (red carpet) and it aims to give Amsterdam a beautiful entrance, not only when you come from the train station, but also when you exit any of the new metro stations. An entry that you may expect from an ambitious metropolis that Amsterdam likes to think it is and tailor-made for its historic city centre. The future situation in front of the station building. The water will be opened up again and cars will almost be completely banned. 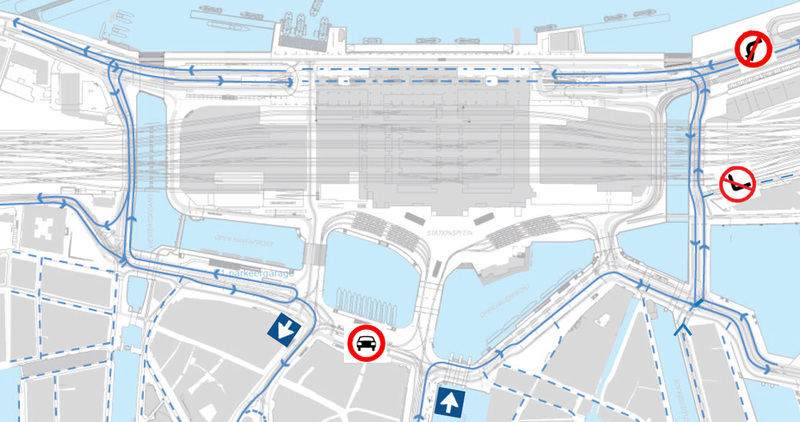 It will become possible to exit the station and walk straight on – all the way to Dam Square – without having to cross any lanes for motor traffic. The red carpet starts at Central Station and follows the new North-South metro line south through the entire city centre. The city designated the pedestrian as the main user of the area and this group of road users is to get most of the space. To a lesser extent cycling is also a main user of the space. Private motor traffic is to be banned from the area as much as possible. 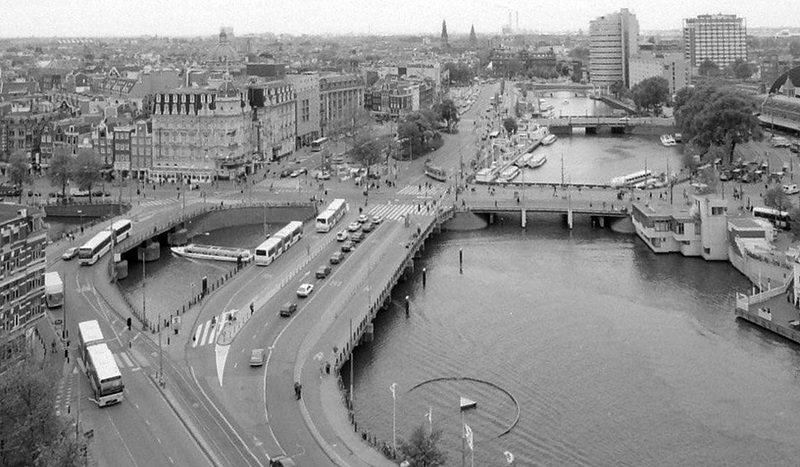 But Amsterdam did not just close the road (like Utrecht already did in the 1990s) it built a completely new road first. So traffic that has so-far taken a route in front of Central Station can now take a route behind that same station. A very expensive tunnel was built – and opened a few months ago – to make that possible. The traffic situation in 1990. All the black lines were (multiple) lanes for motor traffic. The future situation for motor traffic. Only the blue lines will be (single) car lanes. In the bottom of the picture you can see the beginning and end of the “city centre” loop. One lane that is one way for motor traffic. With the cars mostly gone, a lot of space can be allocated to the thousands of pedestrians that walk here daily. The trams will still use the square in front of the station, but many cities in the world have proven that trams work well in a mainly pedestrianised area. People cycling also get a bit more space on new routes in the redeveloped area of the station island and the roads around it. The network of cycleways around Amsterdam’s Central Railway Station (almost all bi-directional). Also on this map the locations of the (future) bicycle parking facilities. There will still be one lane for motor traffic on the east side of the area. That lane is part of the city centre loop for motor traffic. This loop can also be used by the many tourist buses. A lot of tourists get off the bus here to walk into the city centre or to go to one of the many hotels in the area. Private motor traffic will also be restricted on the ‘red carpet’ into the city centre. But the city is investigating if it can be restricted even more. Just last month a report was published about traffic volumes on Muntplein. This study shows that it may be possible to restrict motor traffic even further if that traffic is led around the area better. There turns out to be a lot of traffic that has no business there. Leading that traffic away would open up the area for traffic that does have a business there, such as for deliveries, residents and visitors. By studying the license plates of motor traffic in and around the area it became clear that 65% of all motor traffic shouldn’t really be there. Of that traffic 20% needs to be in the area just around the city centre, 15% only traverses the city centre but has business elsewhere and 30% drives around in circles. Partly to find a parking spot but a large part of that last group is formed by taxis – without passengers – driving from one taxi stand to the other. (Taxis are not allowed to pick up customers in the streets in The Netherlands so driving around is pointless and unwanted). It will be interesting to see how these latest findings will be implemented in the plans that are partly still under development but partly being built already. Damrak, the street from the station to Dam square, has already been finished. Incidentally not to everybody’s liking. The cycleways are considered far too narrow by some for the volumes of cycling there (only two metres wide in one direction). It will take quite a while before the area in front of Central Station is finished, at least until 2018. So this week’s video really shows the before situation of this major project. 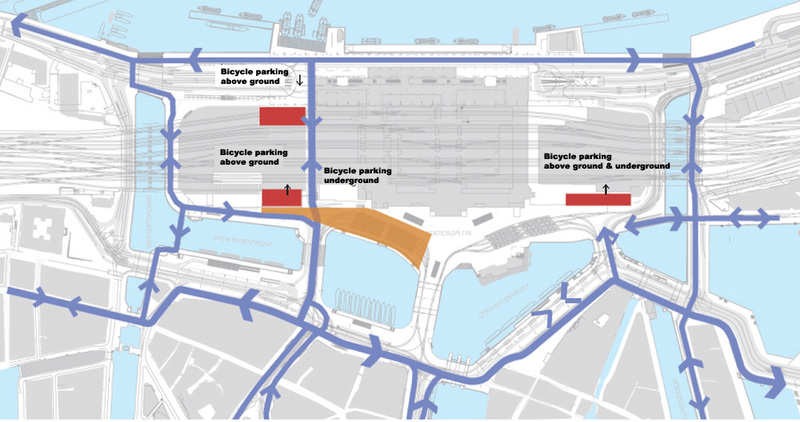 The map above shows the previously planned locations of the bicycle parking facilities. There is a more recent map now. Which you find below. Updated map with the new proposed locations of the bicycle parking facilities with the number of bicycles that it can hold. In January 2017 it was announced that the transformation would take place from 2018 to 2023. A new rendering was also published. That’s a great capture of the motorist going in reverse to avoid blocking the tram, and then that taxi driver speeds up to claim some space of their own, driving right across the tram’s path! Your video started me thinking about comparing footprint spaces of cars versus humans. A representative Ford car is about 6 feet by 16 feet or roughly 100 square feet (US measurements). A human might be about 3 square feet and with a bicycle about 6 square feet. Considering the buffering spaces they all require, does this mean that approximately 30 pedestrians can utilize the same space as one car? And 15 humans with bicycles? That sounds like by minimizing the access by cars the efficiency of the space is considerably increased. Plus, when the pedestrian arrives at destination, that footprint requirement goes to zero. Since the bicycles can be stacked, that footprint is cut on half. Alas, the car still requires its 100 square feet whether the human is inside or not. I hope my math is not too messed up. It’s great to see you guys working hard to resolve the problems. You’re not the first to notice that. 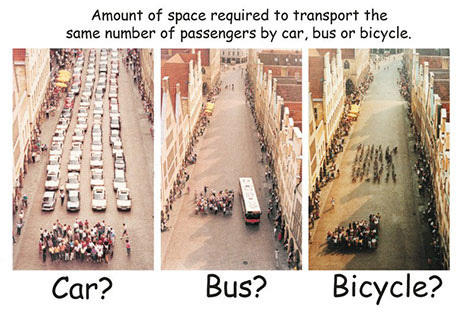 There is for example the image at https://1.bp.blogspot.com/-Do5n1raMolk/TzZJLqMWQoI/AAAAAAAAGMk/TMIZAVRczGE/s1600/amount-of-space-required-cars-bus-bicycles-poster.jpg in various variants. Regarding the factors I can say that one car parking place is enough for 8 to 10 bicycles; when driving/riding the calculation gets more difficult because of the increased buffering space. I think the space requirements for a bicyclist are a little larger. A bicycle is about 6 feet long and the handlebars are about 2.5 feet wide, so a bicycle needs a minimum of 15 square feet. But that’s when stationary! Moving bikes and people walking need more space, and that’s dependent on the culture. 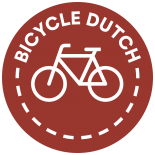 For example, I believe that Dutch are more willing to cycle close to each other than Americans, so the American bicyclist footprint would be a little larger. This is great, I had a very bad impression of Amsterdam after leaving the station, I had to walk quite a long distance before I felt I was at a destination, rather than escaping an area design mostly for cars. The large “car sewer” forms a moat around the area, very unpleasant. I am wondering about how often the Dutch do end up in collisions and get fines. How effective things like sustainable feel to the average person. How many collisions Mark and traffic tickets have you got, and if you want to share, why they happened? This includes on sided collisions, like hitting the curb with the wheel. On another note, how often do you drive? I drive mainly because I am learning to, but you probably have a B or BE license, like most adults. I’ve cycled all my live in NL from about 4-5 years old until I moved abroad at 32. I remember a single accident where I rear-ended a car who had just overtaken me and then braked sharply for an oncoming truck in a turn. Other than that, I’ve had a few one-sided collisions: one with a traffic sign when I wasn’t paying attention as a kid, and a couple with the ground when it was icy and I wasn’t aware of that. Maybe I’m forgetting some minor cycle-cycle collisions. I don’t consider myself out of the ordinary with this history. As a car driver (never owned a car, so don’t drive a lot), I only once nearly hit a cyclist who didn’t have lights at night and I wasn’t looking very carefully. I’m a bit disoriented on the first picture. What is the building on the right side of that picture? The low structure directly at the side of the water is a metro entrance. I think he means the Victoria Hotel on the first picture. The picture is taken looking east, the opposite direction of the images around 1:40 (looking west). No, both pictures look from East to West. The drawing more North-West and the 1995 picture more South-West. So on both pictures the Victoria Hotel is on the left hand side (but on the drawing only the corner is visible). The main building of the station is on the right hand side both times, but just outside the 1995 picture. On that 1995 picture you can just see the corner of the water side terrace of the Coffee House that is on the right hand side. Which is completely visible on the drawing. The map of the locations of the parking facilities was indeed from the 2011 plan. So I will also pubish the updated version. Thanks! This entry was posted on 1 December 2015 by Bicycle Dutch in Original posts and tagged Amsterdam, history, urban design.